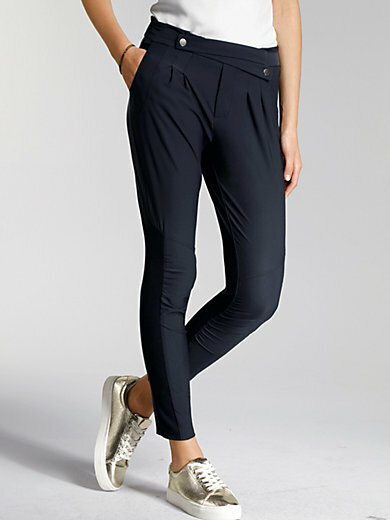 Ankle-length jersey trousers by COMMA: a fashion it-piece in highly elasticated techno­stretch. Satin stripes at the side (75% viscose, 20% polyester, 5% elastane). Figure-flattering dividing seams. Belt on front waistband held in place with press studs – elasticated waistband at the back. 92% nylon, 8% elastane. Inside leg length approx. 28ins. Ankle width approx. 10ins. The trousers are machine washable.